Are you ever afraid someone will ask you why you believe what you believe? Do you fear someone might question what you believe? Responding to people’s questions and challenges can get complicated—but what if you were confident? What if you had the answer to the most important question about your faith? In our new series, “Prepared,” you’ll learn the tools of the trade and gain a tactical advantage that will help you share your faith. 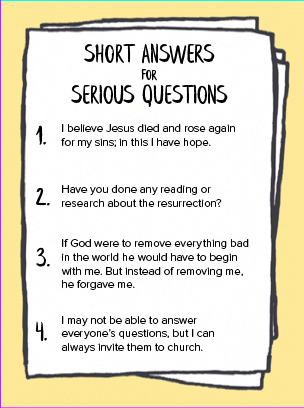 Download the Short Answers to Serious Questions here.